I look back at the pictures, out to sea, and you could have the idea that the wind was blowing. At least in some of them. Last week on Tuesday (June 13 – amid all the sailing conventions for when not to leave, is the 13th of any month also bad luck? Together with any Friday, on which one is specifically not to undertake the beginning of any substantial voyage, or risk the misfortunes that befall those who mess with the sailing spirits.) At any rate, unsure of the particular protocol, and with forecasts for the ideal wind, we set out from Gouldsboro Bay, with big ideas for travel. We had a nice sendoff, from Chubba and Roger, out in Chubba’s skiff. We were in hopes of a good, sturdy northerly wind for two days and one night. 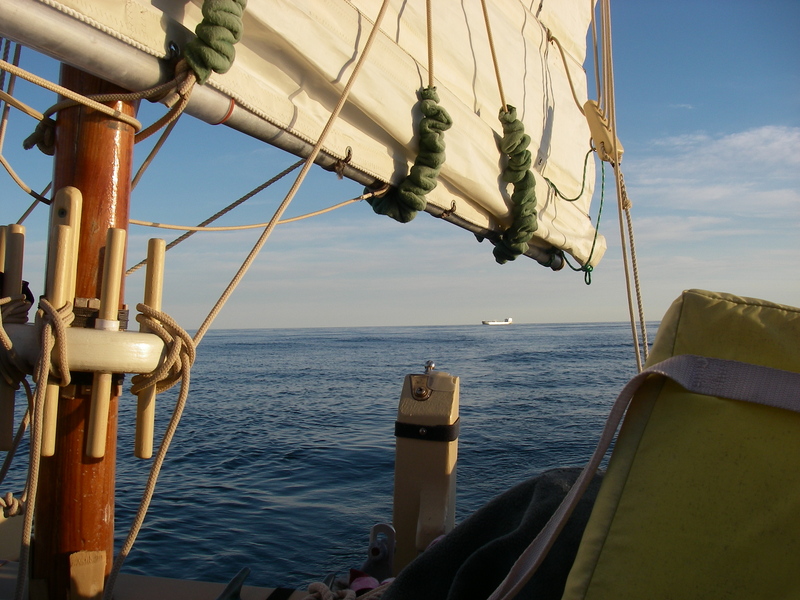 With that in mind, the goal was to sail south out of Gouldsboro Bay, and to keep going until either Cape Ann or Cape Cod was somewhere in sight, one hundred and some miles to the south and west. Instead, about an hour after passing Mount Desert Rock, officially the start of the long journey and already about 20 nautical miles offshore, the wind basically died. That was about 11:30 PM, or 2330 hours. 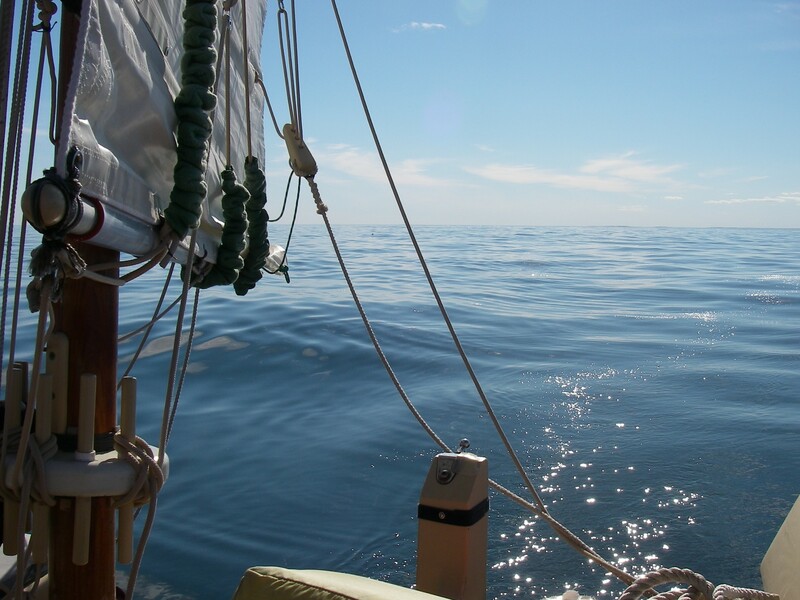 We sailed on through the night, AUKLET and I, but in place of our previous steady progress there was barely enough breeze to maintain our course. When the sun rose, instead of open water in all directions, the mountains of Mount Desert Island and Acadia National Park were at some distance but still clearly in view. This was not good! At least from the perspective of human plans and a preconceived notion of what might be achieved in the next couple of days, as far as transport to warmer and sandier surroundings. The original plan involved making significant southerly progress before a major wind shift to the south on Thursday morning, that would be my ticket to turn west and go in toward shore, somewhere in Massachusetts or its islands. 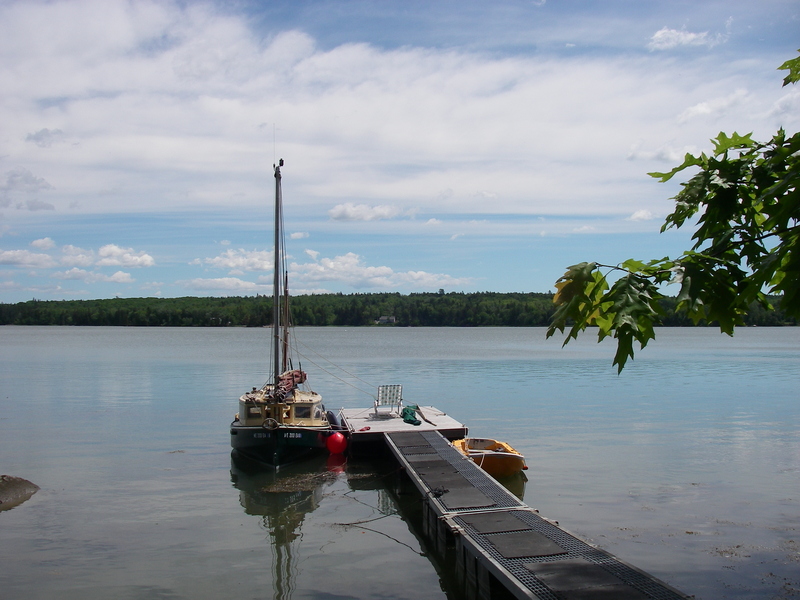 I had kidded that I might end up in Casco Bay, the big bay near Portland, Maine, but it was really not the idea. As Wednesday unfolded with only occasional riffles on the water, even Casco Bay seemed highly unlikely. The harbor at Matinicus Island appeared possible for a little while, and then not, as the tiny wind shifted northwest, putting the island directly upwind. Isle au Haut became a bit of an option, if that little breeze out of the northwest lasted, but as the afternoon went on this prospect, still about 8 miles distant, developed into something that would likely mean arrival in that cozy harbor sometime after midnight. And that only if the now disappearing tiny breeze somehow revived. The prospect of such fussy sailing for so many hours, and staying awake for all of it, seemed both unpleasant and unrealistic. So toward the end of the afternoon we turned again toward the open water, in order to get enough distance between the boat and any land for some calm rest away from the possibility of rocks. Fortunately, traffic in this area is minimal, making substantial naps a real option if there is enough surrounding water. The radar detector makes an unholy racket in the presence of any other boats’ radar signals, so there is very little danger from other vessels that might be out and about. As well, the AIS transmitter/receiver informs ships and other craft of our presence, and us of theirs, using a VHF radio signal that makes only a minimal dent in the electricity budget on the boat. The AIS also calculates “closest point of approach,” and when that will happen, along with providing a visual image of where everybody is and is going. Technically, single handing and taking naps at sea is completely against international navigation rules. On a ship that would damage or destroy anything in its path, the whole approach would be completely inappropriate. On a small boat, where the risk is almost entirely to oneself, and in conditions where problems are unlikely, it feels reasonable enough to undertake. Electronics makes this feel comfortable, to me. Knowing that singlehanded sailors were going forth long before electronics, and coming home to tell about it, leaves me willing to take the chance. At any rate, we did see one cruise ship in the night, apparently coming out of Penobscot Bay and headed for Bar Harbor or somewhere farther on. It was duly announced by both the AIS and the radar detector, and watching its Christmas tree lights pass at about a mile and a half distant gave us a little fun in the dark. The tiny wind came and went, from a variety of directions. The autopilot worked well enough to keep us from sailing back toward land, and in the morning of that third day, with the minimal breath of wind now from the northeast, we made a new effort to return to shore. The forecast said that by midday there would be a real wind, filling in from the southeast, so there was time for more naps before we might start making real progress. In the meantime, there were puffins! These are the tiny seabirds with the extraordinary, enormous, colorful beaks. They first appeared in the evening, going into that second becalmed night, and then again the next morning. They fish underwater, popping up unexpectedly, and swim companionably on the surface a couple of boat lengths away, until down they go again. There was never enough time for a close photo, but the memory shines. The low sun lit those beautiful beaks, and, relative of auklets, we were especially delighted to see them. As if that was not enough bird excitement, on the first morning out we had the pleasure of being a resting point, far out at sea, for this small visitor. I reached to adjust the sheet rather automatically, after coming into the cockpit, and then pulled back when my fingers touched feathers! 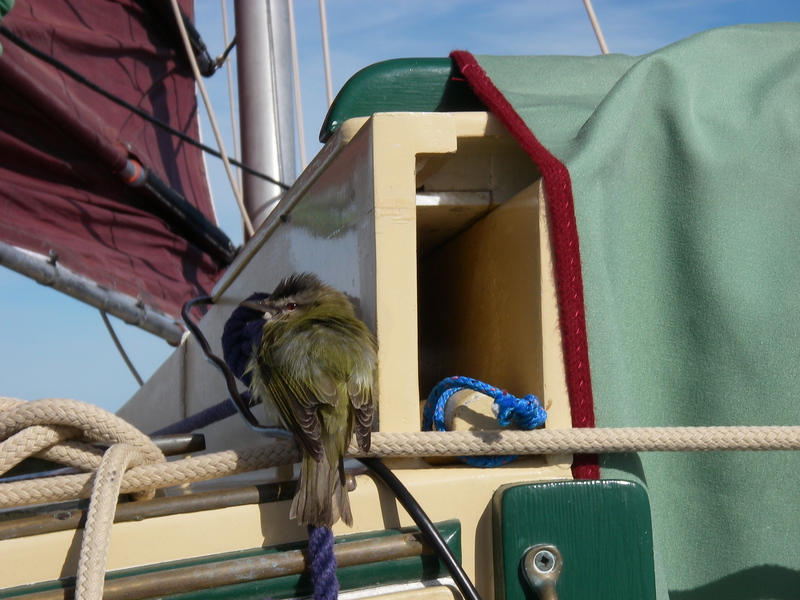 The little bird was exhausted, perching on the taut sheet up near the cleat, and didn’t even flinch. As I watched, it would close its eyes, sleeping after what must have been an overwhelming flight. A little while later it seemed to recover, eyes open and watching me, and eventually flew to the forward part of the top of the cabin where it landed again for a little while, and then was gone. As my own trip became a little long and overmuch, and I occasionally wondered just what I was doing out there, it occurred to me that the entire effort was worthwhile for this one reason. 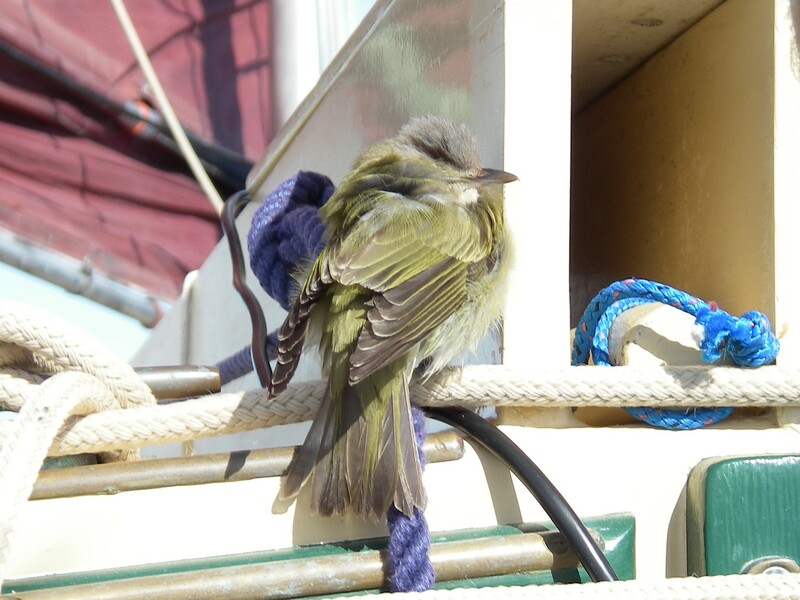 We were in the right place at the right time to provide a resting point for a very, very tired little bird. It did indeed make the effort worthwhile. Eventually, close to noon on the third day, the real wind finally materialized. Swans Island was in range, and by 1730 we were getting closer to the southern entrance to Burnt Coat Harbor. 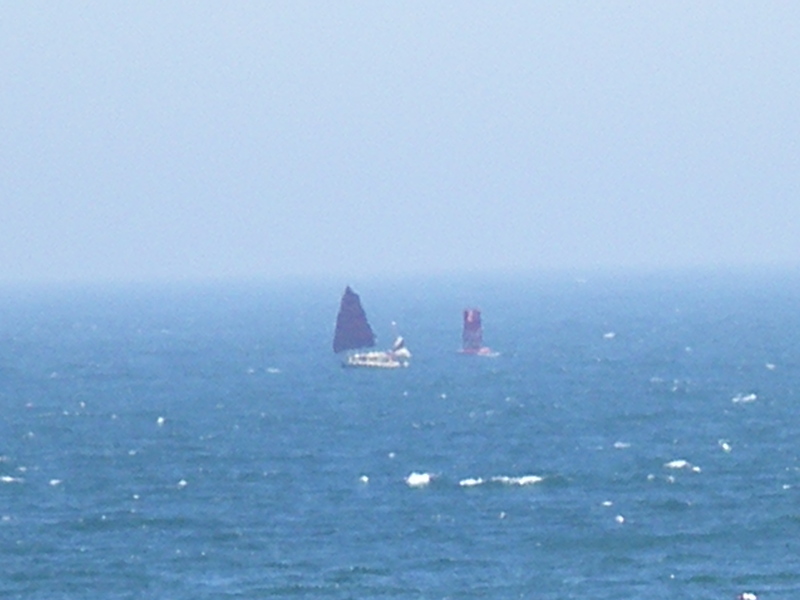 Originally about 13 miles away, the new steady wind made quick work of the bulk of the distance, before the breeze again faded toward the end of the day. It took close to two hours to go the last mile and a half, fortunately with some help from the tide. What a pleasure it was to finally put the anchor down, in that first cove on the right, in the company of several lobster boats on their moorings. With the long solstice days, it wasn’t even getting dark. The next morning, it was anchor up, with an excellent south breeze, and out to sail halfway around the island to Mackerel Cove. This northern harbor is sheltered from southerly winds, and made a good place to settle for the wind, rain, and fog that were due to arrive next. There was a lovely visit with a friend who lives on that shore, and I had some restful days and nights, cuddling up with the warmth of the charcoal stove, watching the fog spill over the hills from the ocean side of the island. Finally, on the fourth day anchored in the cove, the fog opened up a bit. Really, it was clear from Mackerel Cove to Bass Harbor, on Mount Desert Island, about 5 miles away. 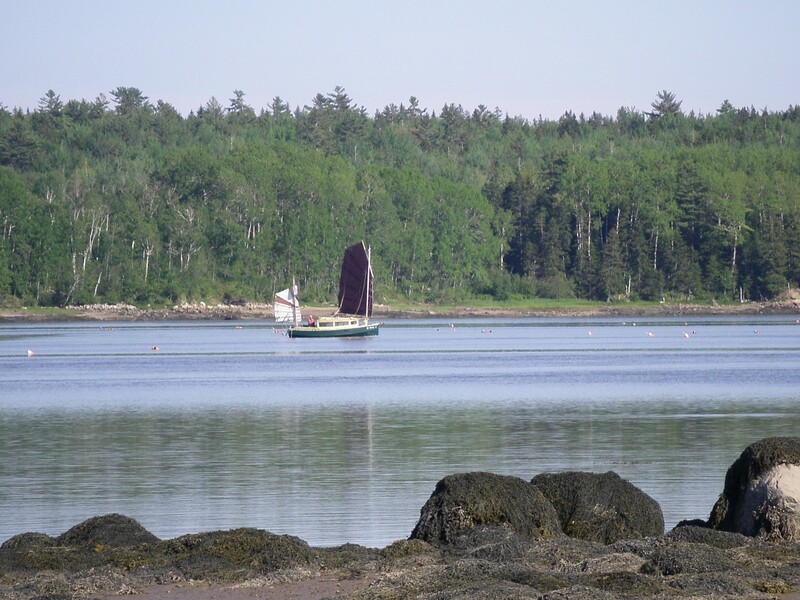 Bass Harbor is not a good harbor for a sailboat in a south wind, but continuing on and around the corner, a range of comfortable destinations were well within reach on the steady 15 to 20 knot wind that was forecast and already blowing. Reefed down to three panels on main and mizzen we made good time, keeping an eye on the edge of the fog bank that obscured the lighthouse at the Bass Harbor Bar, hoping that things would break up at least a little before we got there. No such luck, on the fog! Approaching the bar, and the buoys marking the channel across it, we were shortly completely enveloped. On the bright side, over the winter I had finally broken down and acquired a handheld chartplotter. This gizmo seriously simplifies this kind of low-visibility navigation, compared to what I have been doing all these last years. Taking the latitude and longitude position from the GPS and plotting it on the paper chart – while steering – in combination with the traditional piloting and dead reckoning, was not exactly a smooth process, particularly when trying to hold a steady course without the autopilot. Several friends have been encouraging this move to more advanced electronics, for a very long time. Thank you Bill Cheney, for our conversation last fall that finally tipped the balance toward saying yes to that winter sale. I could not be more pleased. My skills with the new device are rudimentary, but good enough to find the next buoy on the gadget, and to guide the boat to that mark, before setting up for the next one. This is all in combination with the usual routines of laying out compass headings in advance, and keeping track of boat speed, and time, and distances between marks. But how relaxing, to have an additional check on all those calculations, and a visual image of actual progress. Despite visibility of about 200 yards, and some noticeable tidal current, the second half of the day’s trip went forward in a way that was interesting and straightforward, and so markedly less stressful than previous runs in similar conditions that I am an utter convert. Not that I won’t keep practicing the traditional approach – electronic gadgets fail on a regular basis, after all – but I am delighted to have added this bit of ease to my sailing life. Interestingly, this new tool had also come in very handy on the first night of this trip. On the way out to sea, our first destination was to pass by Mount Desert Rock, about 20 miles out from the mouth of Gouldsboro Bay. In the dark it is notoriously difficult to judge distance from a light. Previously I have gone by this tiny island and its lighthouse during nighttime hours with a certain amount of stress, plotting position from the GPS, and watching the bearings change on the handheld compass, but feeling very aware that some small mistake could mean being much too close for comfort, out there in the dark. This approach has involved a substantial amount of peering into the night, and listening for waves on a rocky shore that might be closer than they were supposed to be. The new gadget is quite endearing for so easily reporting distance off of a given mark. 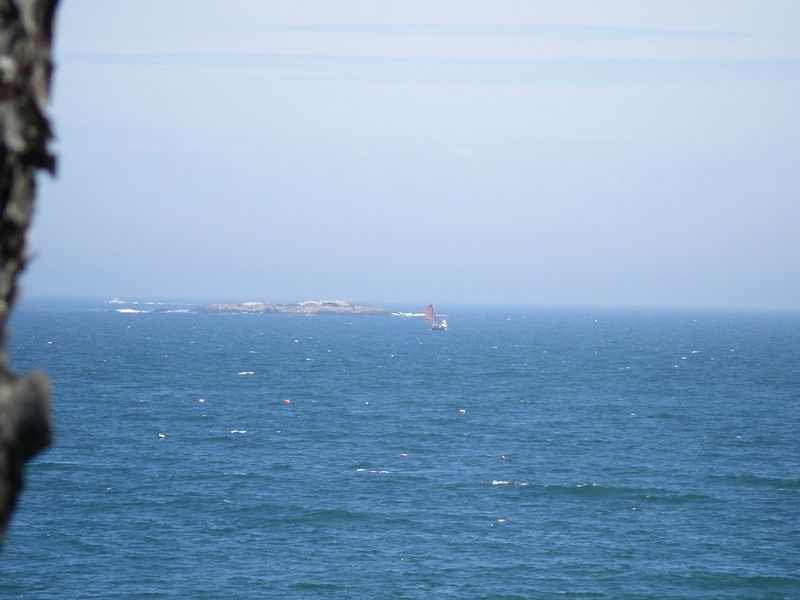 With the Mount Desert Rock lighthouse picked out on the little screen, boat distance was continually shown, reassuringly at over a mile and a half away at its nearest point. The distance of the light continues to be impossible to judge by eye, and I continue to watch anyway, and to listen for surf that shouldn’t be there, but the edge was really taken off of that experience also. The fog a few days later was the ultimate test, but in both of these situations, by far the most noticeable result was how much more relaxing it was to be out there. I’m delighted, and enormously thankful to all of the friends who have encouraged my further expansion into the digital navigation age! 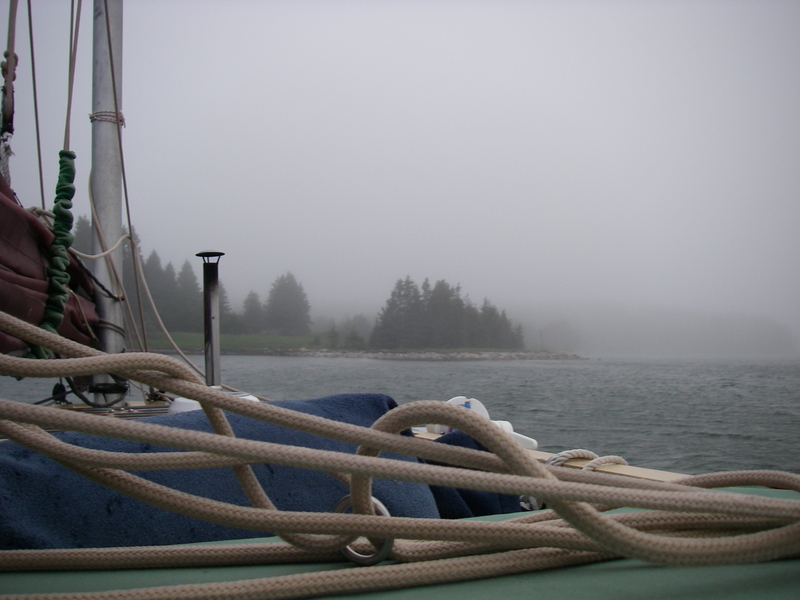 Meanwhile, out there in the fog off of Bass Harbor, the breeze kept up (as did the fog), and we soon turned the corner into Western Way and continued north into the islands around the central Mount Desert Island harbors. Just before the entrance to Northeast Harbor the visibility finally started to open up, showing the edges of nearby island shores, and once into the harbor, with the surrounding warmer land, the air was completely clear. We were at the head of the harbor by 1400, and soon on one of the public moorings, after a little diversion to the float so kindly made available to the public by Thuya Gardens. 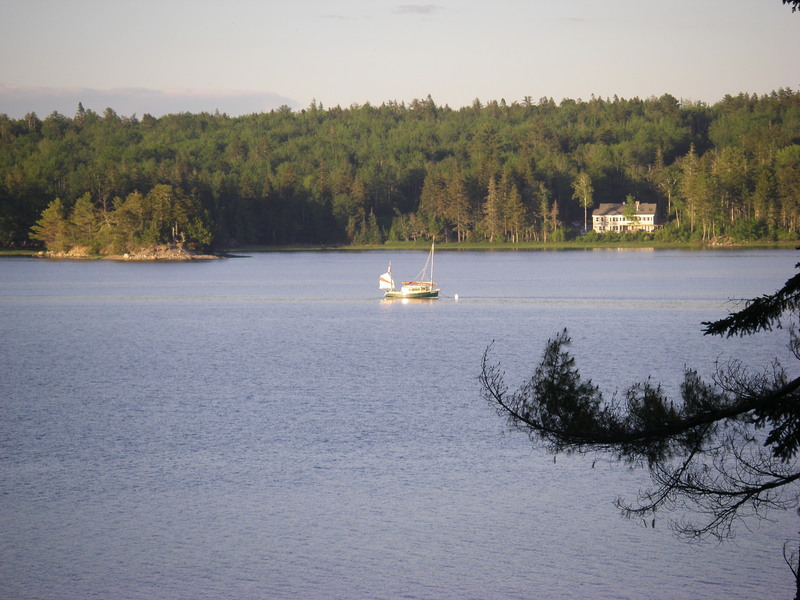 Tomorrow we would be off again, heading the rest of the way to Gouldsboro. 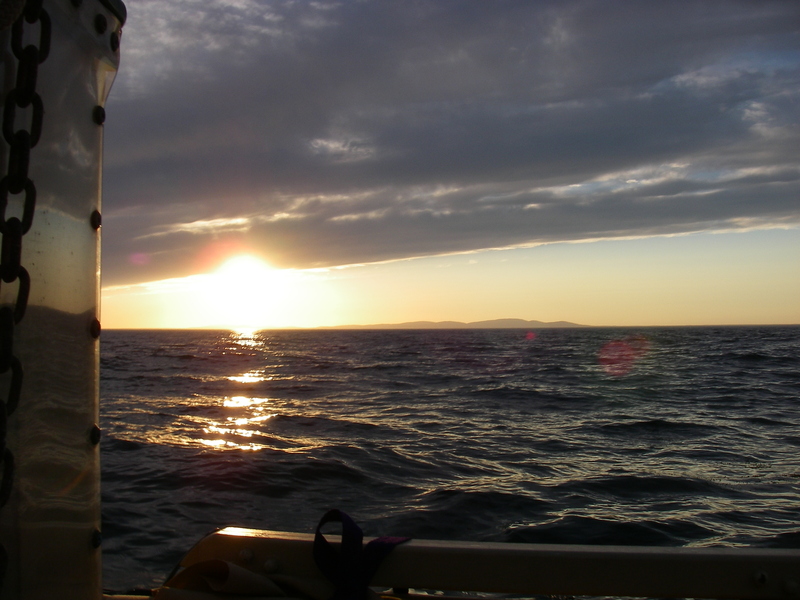 That next day the sun shone, and after a bit of a false start once out of the harbor, with about an hour and a half of near-calm, we inched past the edge of Mount Desert Island and into the good breeze funneling into Frenchman Bay. By about 1400 on this day we had rounded Schoodic Point, flying along with the full mainsail in hopes of beating possible thunderstorms later on. The best fun was that all of this timing happened to coincide with Suzanne visiting with a friend whose house looks out from Prospect Point, just south of Prospect Harbor. 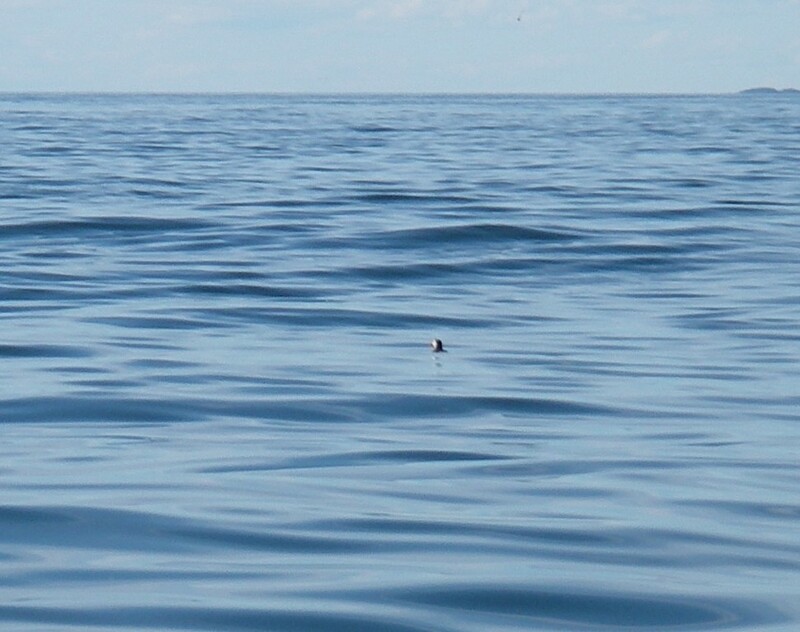 The best course was not close enough for waving, and was at the limits of Suzanne’s camera, but in spite of all that we ended up with a photo record of AUKLET blasting along on the wide Atlantic. A couple of hours later, and several miles up Gouldsboro Bay and then Joy Bay, the wind had died back but the tide was conveniently running in. The lobster pot buoys are now in place for the season in Joy Bay, and provide perfect channel markers between the barely submerged mudflats and mussel bars of the less than half-risen tide. Suzanne was home by then, and took more pictures, from our home float. In the end, the two of us decided that it made no sense to stop and then start again in another two hours when there would be enough water to bring the boat in to the float. So on that perfect, peaceful evening, I picked up the mooring and had one more night in the boat, sleeping in the comfort of knowing that we were almost home. 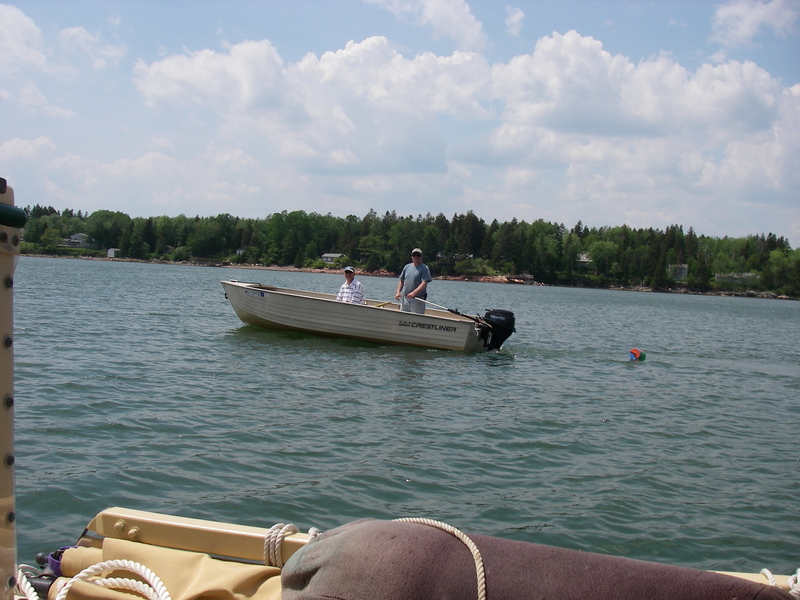 In the morning, on the high tide, the boat and I sailed in to the float. This coming and going and coming back again is the real gift of having moved to this special place on the shore. 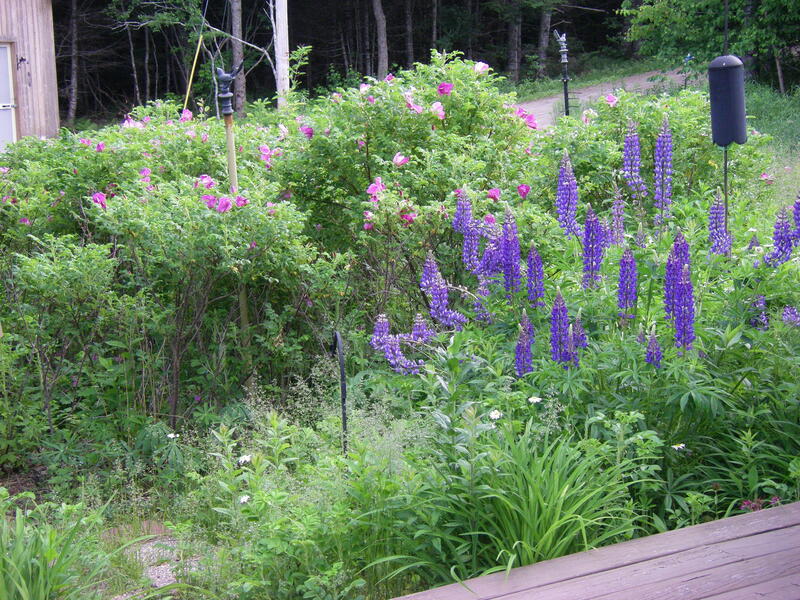 It’s nice to be home, seeing how much the gardens and flowers have grown and come out in these last eight days. 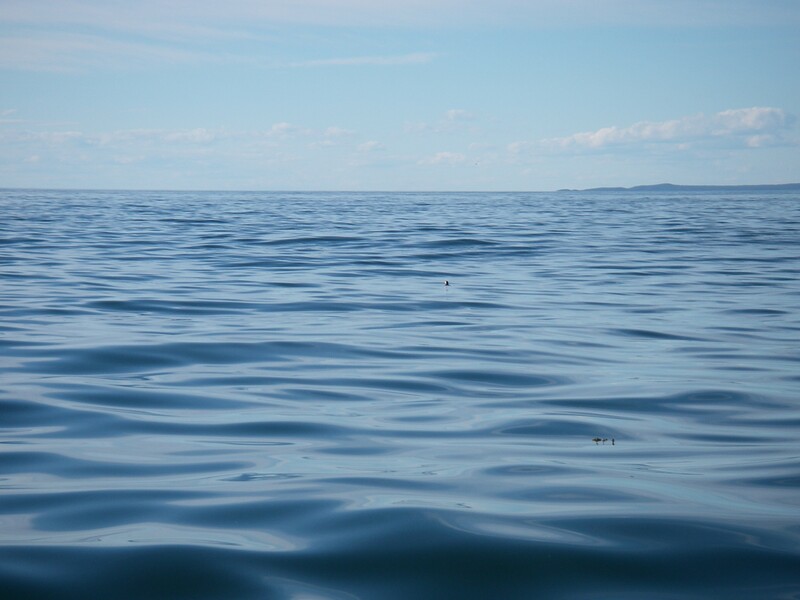 And it’s nice to remember the water, and to carry the vision of puffins, out there in the gentle waves. Maybe if I used a ouija board the before and after would line up better! Always an adventure–whether according to “plan” or not! I would love to see puffins from my boat. Isn’t it! 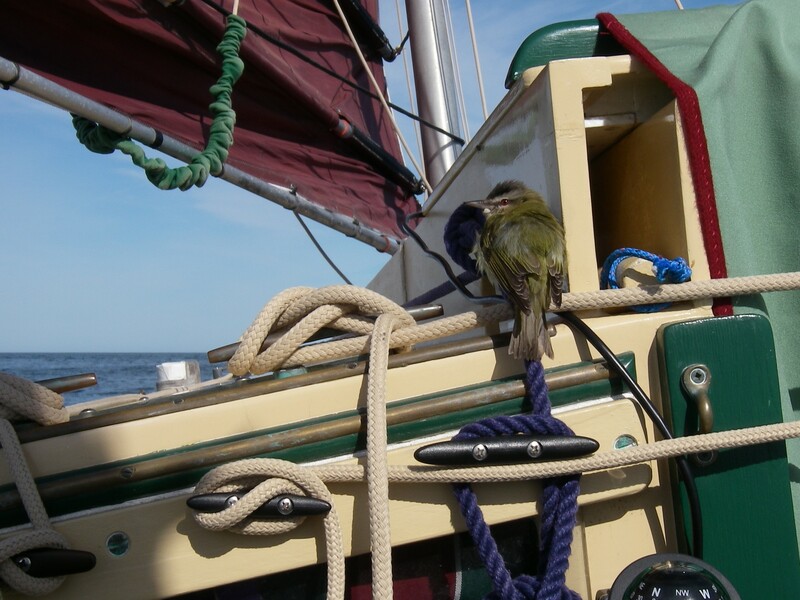 Maybe one day you will decide to trailer your boat to Maine, and see some puffins too… early summer, they say. There’s an island in Muscungus Bay that’s not so far out, where they nest and can also be seen. How is your sailing year going? ?